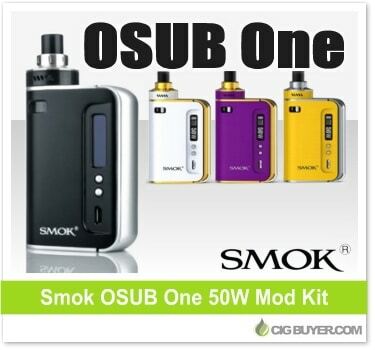 The next step forward for the OSUB platform, the Smok OSUB One 50W Mod Kit is an attractive and feature-filled all-in-one system that not only includes an integrated 2200mAh battery, but a built-in 2ml tank with adjustable top airflow. It has an extremely streamlined profile and includes a side-mounted OLED display with a full-length squeeze firing button on the side. The Smok OSUB One Mod offers up to 50W of output with five output modes and includes temperature control (Ni/Ti/SS) and TCR adjustment down to 0.1 ohms.